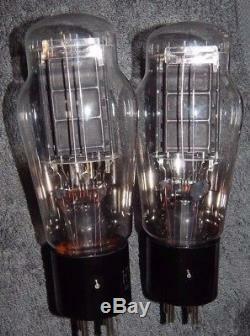 AMAZING MATCHED PAIR OF SUPER HIGH END TYPE 2C45 / 38142 POWER TUBES. 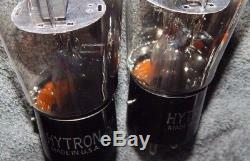 EXTREMELY RARE HYTRON USA MADE TUBES. NO WHERE ELSE WILL YOU FIND THESE SUPER POWER TUBES. BOTH TUBES ARE THE EXACT SAME. MADE WITH TINY SQUARE GETTERS AND DOUBLE SUPPORT RODS. BOTH TUBES HAVE THE EXACT SAME CODES AND DATE CODES. EACH TUBE IS 100% GUARANTEED TO WORK EXCELLENT IN YOUR AMPLIFIER TUBE AUDIO HI-FI STEREO GEAR. EACH TUBE TESTED STRONG EMISSIONS. NO LEAKS NO SHORTS NO LOOSE PIECES 95 , 96. EACH TUBE MADE THE EXACT SAME THE SAME DAY IN THE FACTORY. 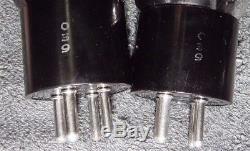 THESE 2 TUBES TESTED NOS AND THEY ARE IN NICE SHAPE VERY CLEAN. 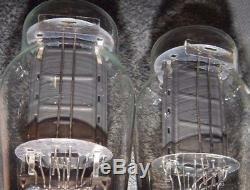 THESE 2 TUBES ARE 7 VOLT POWER TRIODE AMPLIFIER TUBES TYPE 2C45 / 38142. TO TYPE 250 & TYPE 50. WITH A SLIGHTLY LOWER FILAMENT VOLTAGE. THESE 1.8 AMPERE POWER TUBES WILL WORK AWESOME. VERY RARE TO FIND 1950 ERA USA MADE HIGH GRADE VALVES. 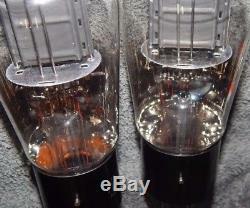 BOTH TUBES ARE 100% GUARANTEED TO WORK EXCELLENT IN YOUR AMPLIFIER TUBE GEAR. DO NOT MISS OUT 2C45 / 38142 TUBES ARE VERY RARE THESE DAYS 38142 IS A MILITARY GRADE NUMBER FOR 2C45. 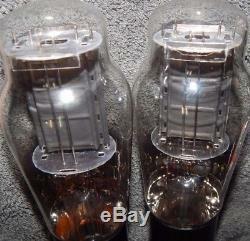 2 TUBES FOR THE SALE 112217- GG VERY NICE MATCHED PAIR. Is forced to issue the following policy statement. These policies are put in place due to a few unscrupulous buyers. We strive to make our customers happy by offering a wide variety of Vacuum Tubes, and other merchandise, at reasonable prices. By ordering from Old Guy Radiola you agree to the policies stated herein. Incorrect tubes may be destroyed by placing in the wrong socket we cannot give credit for tubes plugged into the wrong socket. 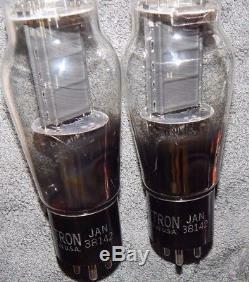 This is New Old Stock and since vacuum tubes were made 30 70 years ago New Old Stock may have cosmetic evidence of age. This includes poor print, oxidized pins, faint discoloration, or some grime. Unless otherwise indicated in the listing we test all tubes to assure they function as new. These are tubes that are used with clear discolorations from use. For heavy oxidation we will clean the pins. Examine the photographs carefully to assure that the item meets your expectation for print, codes, discoloration, oxidation and other cosmetic defects. These are photographs of the actual product listed, we do not use Stock Photographs. Tone Quality / Noise / Microphonics. The tone, noise, and microphonics of a vacuum tube is very subjective. Standard testing of the tubes that we offer for sale do not include any of this type of testing. Unless a listing says that it is guaranteed low noise" or "guaranteed no microphonics these conditions will not be considered defective. Unfortunately these services are more expensive, and any additional cost shall be the buyers responsibility. Except for as is listings we guarantee our tube against defects for mutual conductance, voltage, and leakage. The testing is done on Vintage tube testers. Transistorized tube testers such as the AT-1000 results are not considered valid as they differ from the original manufacturers test set. Unless a listing says that it is guaranteed low noise, or guaranteed no microphonics these conditions will not be considered defective. METAL BASE TELEFUNKEN EL34 GZ34 5AR4 HOLLAND WEST GERMANY PINCHED WAIST 6922 FOIL D GETTER. ROUND BLACK PLATES TUNGSOL 6SN7 VT-231. 349a 348a 348a silver mesh plate el34 metal plate gz34 5ar4 6sn7 vt-2316sl7 ecc803s telefunken england west germany valvo cca tungsol 421a 422a 5998 7119 e182cc 12au7 ecc802s foil d getter pinch waist. 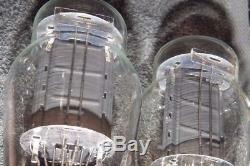 BENDIX 6900 RCA GENERAL ELECTRIC WESTERN TELEFUNKEN MULLARD 2C51 12AX7 ECC83 ECC803S ECC802A ECC801S 12AT7 KT88 KT77 KT66 6L6 6SN7 6SL7 ECC35 ECC32 ECC33 6CA4 EZ81 EZ80 6201 MCINTOSH BOGEN FENDER FISHER VINTAGE HOLY GRAIL STEREO HI-FI. 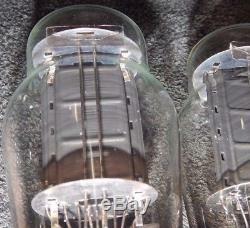 The item "MEGA RARE MATCHED PAIR 2C45 HYTRON JAN 38142 POWER TUBES HIGH END 50 / 250 #10" is in sale since Wednesday, March 14, 2018. This item is in the category "Consumer Electronics\Vintage Electronics\Vintage Audio & Video\Vintage Parts & Accessories\Vintage Tubes & Tube Sockets". 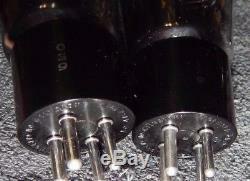 The seller is "bangybangtubes" and is located in North Las Vegas, Nevada. This item can be shipped worldwide.